Hanspree, the Taiwanese display manufacturing group possibly best known for its novelty TVs but also behind the Hanns G display brand, has announced it will open its first own-branded European retail outlet at the Westfield London. The 1,483 sq ft store will primarily exist to show off Hanspree's unique TVs, which the company feels are best experienced in the flesh, so to speak. There will also be more regular TVs and the Hanns G displays. "Westfield London was our first choice UK destination for the new store and we are extremely pleased to be in a position to announce the opening after a year of planning," said Martin Kent, UK and northern Europe manager of Hannspree. "Our products really do stand out on the shelf, so it is fantastic to finally have a hub where we can really showcase the designs and construction that make Hannspree products so unique. Westfield London boasts a heavy footfall, ideal location and unrivalled partner support for retailers. Already Westfield London has been very supportive in getting the store up and running and has big, exciting plans for the store opening event in November." 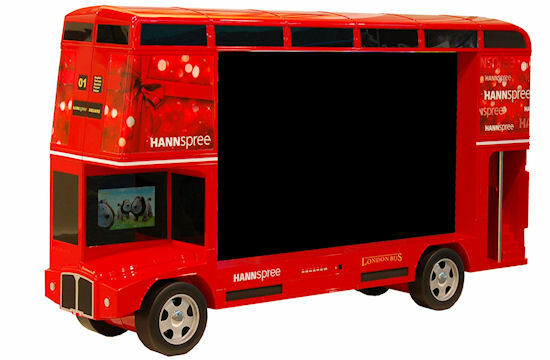 To promote the new store Hannspree will be embarking on an advertising campaign focused on public transport, and has even designed a special telly for the event. Striking AMD Ryzen Threadripper 2000 packaging revealed Nvidia UK bundling Kingston SSDs with select GTX10 GPUs Europe fines LCD companies €649 million for price fixing HANNspree belatedly joins the netbook party HANNspree novelty TVs - so bad they're wonderful!